The SMY 60W Box Mod is an awesome new variable wattage mod with a full color display screen that provides up to 60W of power. The screen includes a large wattage gauge, easy-to-navigate icons and a variety of cool features you won’t find anywhere else. 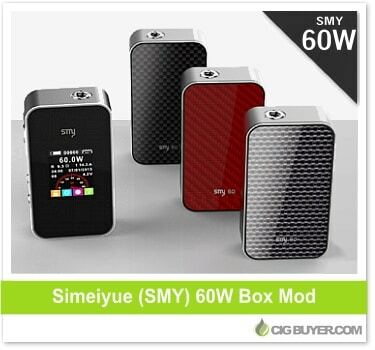 Controlled by two buttons and a firing switch on the side, the SMY 60W Mod requires a single 18650 battery which can be installed by removing the carbon fiber plate on the rear. Styled almost like an iPhone, it can be fired down to 0.3 ohms and comes in black, blue and red.